Is your WiFi not working as well as it used to? In this tutorial, you’ll learn how to fix slow WiFi and other WiFi problems which are often caused by signal interference. First, we’ll measure the signal interference, change our WiFi channel, and if necessary, adjust the transmit power. Changing WiFi channels can reduce the amount of channel noise, increase range and stabilize connectivity. Increasing the transmit power can strengthen your broadcast. 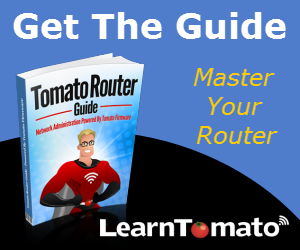 NOTE: If you are not running Tomato firmware on your router, you can still benefit from the principals found below, providing of course that your router offers the features we are discussing. Make sure that your WiFi antenna’s are clear of obstructions and centrally located away from large metal objects. Then, make sure all antennas are pointed correctly to ensure proper signal polarization. You can learn more about WiFi antennas here. First, we need to establish a baseline and essentially calibrate the noise floor of the frequency band we’ll be working with. 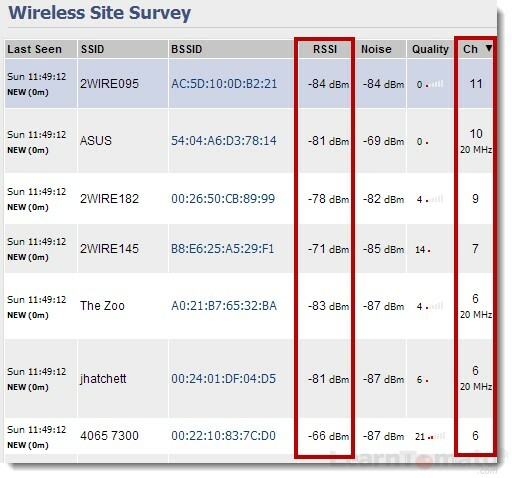 We’ll assume that you are working with a 2.4GHz wireless signal. However, the fundamentals are the same for 5GHz, only the channels are different. Since I have a dual band router, I can check the noise floor for both/either bands. As you can see, after clicking “Measure”, the noise floor for the 2.4GHz band was established at -86 dBm. 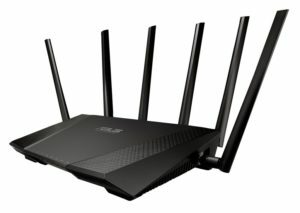 If your WiFi is not working well, it is most likely due to channel interference. And the best way to find out is by performing a site survey. 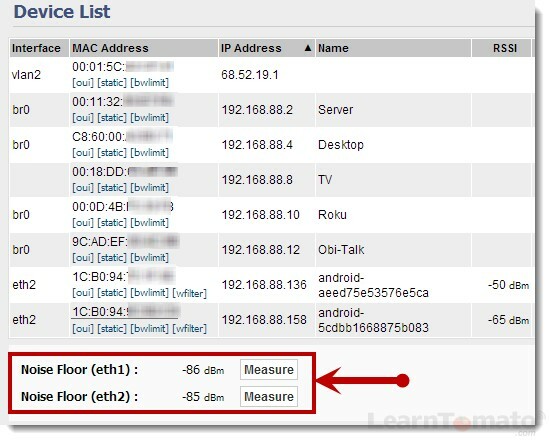 If you are unable to locate an unused WiFi channel, the idea is to find one with the least interference. Choose a channel whereby most of the RSSI is in the range of -90 to -80 dBm. RSSI stands for “Received Signal Strength Indication.” The more negative that number is, the better. For example: -80dBm is weaker than -60dBm. You want to broadcast where the weakest signal is. 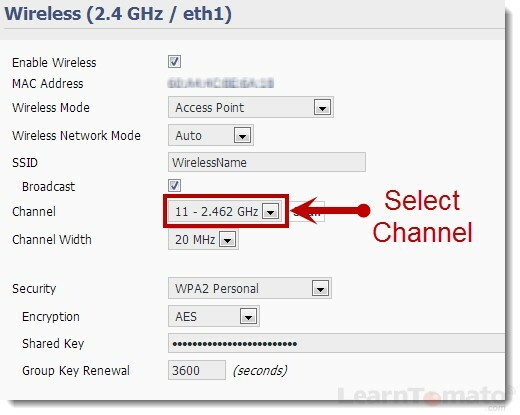 Once you’ve determined the best channel with the least amount of noise, you can improve the wireless signal by manually selecting the channel and channel width. I’m going to use channel 11. For one thing there are less people using this channel. Secondly, channel 11 has a RSSI over -80dBm which should not interfere with my network. I’m also going to use a 20MHz channel width for now. If this channel proves to give me a solid dependable connection, then I may consider using the 40MHz channel width to increase bandwidth. Ok, now that we have selected the best channel possible, we may be able to further decrease signal attenuation (loss) by increasing the transmit power. Signal attenuation is the loss of signal due to obstacles, noise, distance, etc. IMPORTANT: How much you can increase the transmit power depends on the hardware in your router. Do NOT exceed your hardware limitations. Increasing the transmit power requires that you increase the voltage to the radio transmitter. More volts = more heat, and too much heat can burn up your router. In my case, I’m using an Asus RT-N66U router. The Tomato firmware allows a maximum setting of 250mW transmit power. (A milliwatt is equal to one thousandth of a watt.) However, just because the firmware can handle a setting of up to 250mW, doesn’t mean it should be maxed out. Understand that increasing the wireless transmit power causes more radio noise. Manually change the “Transmit Power” to an acceptable level for your device. 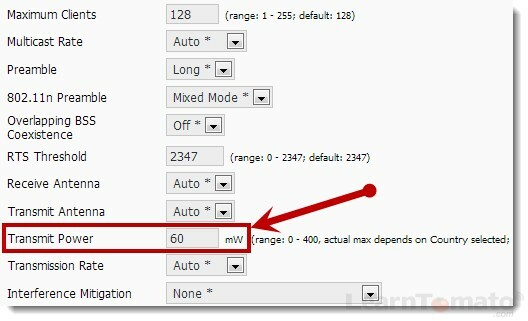 On most ASUS and Linksys routers, you should be fine up to 150mW but 70mW or less will keep you on the safe side. 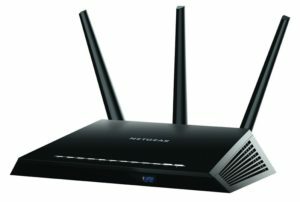 If you have a dual band router with both 2.4GHz and 5GHz, you’ll have two radio transmitters, and a setting for each band. Some people argue that the benefits of increasing the transmit power are nulled by the additional noise that it creates. Think of it like turning up the volume on a stereo. Just because the sound is “loud” doesn’t mean that the sound is clear. As a result, many people prefer to leave their transmit power alone and instead, buy an aftermarket antenna. In any case, measuring the noise floor and changing the channel to one with less interference can often fix slow WiFi and other WiFi problems.